Who knew geometry could be so beautiful? 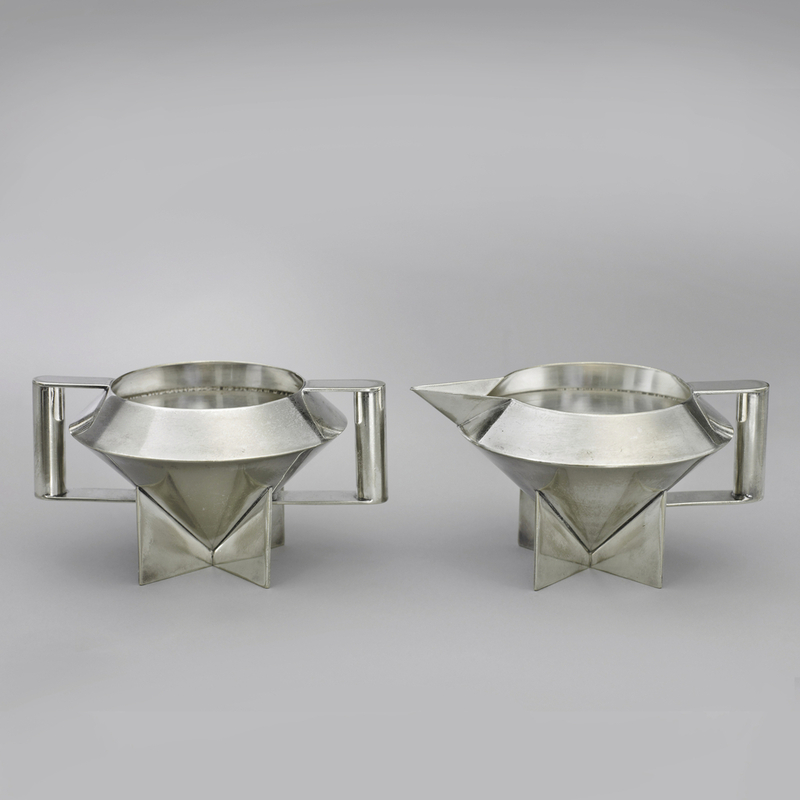 This 1928 sugar bowl and creamer set epitomizes American modern design; yet, it is clearly influenced by the modern turn of European design from the same period, as evidenced by the Exposition internationale des Arts décoratifs et industriels modernes in Paris, 1925, as well as by Walter Gropius’ new design for the Bauhaus school in Dessau, Germany, also in 1925. Ilonka Karasz, who was trained at the Royal School of Arts and Crafts in Budapest and later worked in New York, was one of the avant-garde American designers who responded to this modern turn, although her early style reflected her Wiener Workstätte-inflected training and a preference for folk style and bold colors. With this sugar bowl (which is part of a suite of tableware), Karasz pared down her design to basic geometric forms – an inverted cone, a cross, a cube, which can be clearly observed in her preparatory sketch. 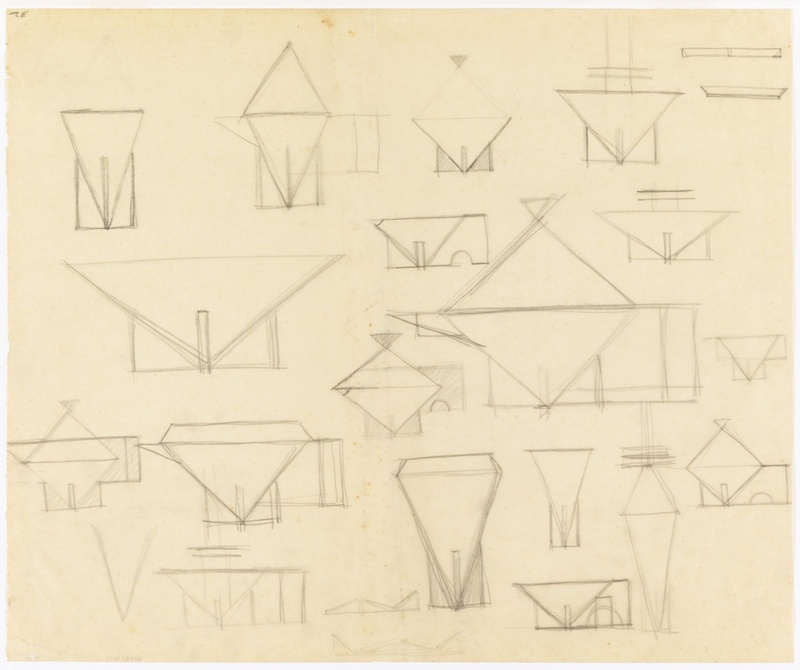 The use of cones in the design connotes speed; Karasz’s rectilinear composition displays a purity of design not unlike that of Josef Hoffmann, Raymond Loewy, and Donald Deskey (also a contemporary of Karasz in the American Designers Gallery). Karasz’ design is also bold in that it could be mechanically reproduced. Indeed, this sugar bowl and creamer set was made by the Paye & Baker Manufacturing Company, who chose to produce this design in electro-plated nickel silver. Electro-plating involves coating a metal object (for example, made of copper), with a thin layer of another metal or alloy – in this case, nickel silver, by dipping it into a solution of the metal or alloy and using electrical forces to have it adhere to the surface of the object. Karasz’ designs were featured in the exhibition American Modern: 1925-1940 at the Metropolitan Museum of Art in 2000, as well as in the exhibition Enchanting Modern at the Georgia Museum of Art in 2002. Enchanting, American, Modern: a perfect description for this sugar bowl and creamer set. Catherine Powell is a graduate student in the History of Design and Curatorial Studies program at Parsons The New School for Design. She is a Fellow in the Product Design and Decorative Arts Department of the Cooper Hewitt Smithsonian Design Museum.